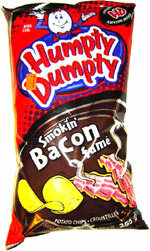 Taste test: These are probably the same chips listed here on the site as "Humpty Dumpty Smokey Bacon Potato Chips," but the good folks at H.D. have renamed the chips (by changing smokey to smokin'), as well as re-designing the chip bag itself. These chips are really good, they have a strong smokey bacon taste, not a lot of powder that sticks to your hand, and will definitely remind you of eating bacon. It's tough to eat a whole bag of these, however, in one sitting, because after a while the bacon flavor (or flavour if you're from Canada) gets to be too much. Smell test: A slight bacon aroma. At first I thought of a pancake breakfast when smelling these, it was probably the bacon doing that.